The Vancouver Condo Buzz » From Mid $200’s > The CORDOVAN Vancouver Eastside Apartments & City Homes for Sale by Boffo > 24 Opportunities in East Side Vancouver Cordovan Cityhomes & Condos! « Introducing The Ridge at Bose Farms Surrey Condos for Sale! Bringing new life to a heritage landmark at Bose Farms in Surrey BC > Apartments from $129,900! From Mid $200’s > The CORDOVAN Vancouver Eastside Apartments & City Homes for Sale by Boffo > 24 Opportunities in East Side Vancouver Cordovan Cityhomes & Condos! CORDOVAN Vancouver Apartments – Reside Eastside! 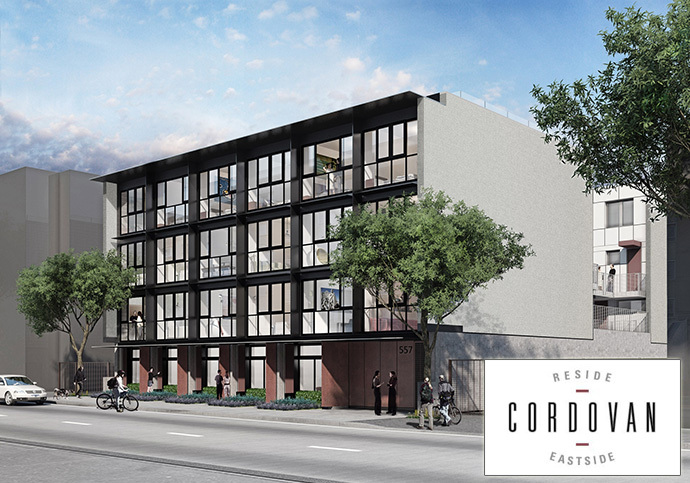 The time has come to reside in Eastside Vancouver and the most exciting new project is at the Cordovan Apartments located at 557 East Cordova Street Vancouver! The boutique 4 storey low-rise building will offer only 24 opportunities to purchase a brand new home with unit floor plans starting from 550 square feet all the way to multi-level cityhomes at 1,090 square feet. The 24 industrial influenced homes at the Cordovan Vancouver Eastside apartments are located in an emerging pocket that is full of character, history, arts and transit. On site will be bike facilities, a private landscaped courtyard and a car share program too. The boutique and contemporary architecture is by Gair Williamson Architects and the interior design is by BYU Design Group. The developer is well established Boffo Properties. Within walking distance of the Eastside Vancouver Cordovan Apartments is Railtown, Gastown and Strathcona. The spacious 1 bedroom plus flex space floor plans start from an incredible price point from the mid $200’s. The large 2 bedroom plus flex space homes start from the mid $400’s. 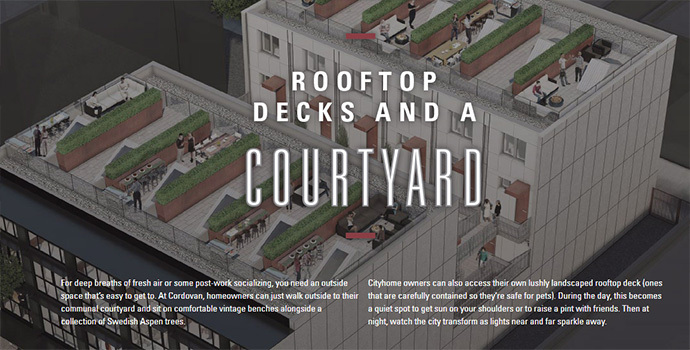 These Vancouver Cordovan Cityhomes also feature rooftop decks (in select plans). There is a Modo Car Share program plus stall and all home buyers receive a one year casual membership. As well, The Cordovan Vancouver apartments have parking for electric vehicles and a bike repair room. From parks to cobblestone streets and from one of a kind retail stores and local grocers, the neighbourhood will feature some of the most unique and eclectic boulevards and shops for you to explore. The charming Eastside Vancouver community is ever evolving. Meet Cordovan Vancouver Eastside apartments: boutique flats and two storey homes with light, open interiors and extras like roof decks and your very own front door! Priced from the mid $200’s, you can now register online at www.cordovan.ca. Being affordable does not mean cheap finishes. On the contrary, the new Vancouver East Side condo project features some of the best finishes we’ve seen in the property market this year … all at a very affordable presale price point. The Cordovan Vancouver East Side condos will have over height ceilings in most living areas as well as single plank, gently textured Oak finish laminate floors. There is a thirty five year warranty on the laminate floors plus the option for home buyers to upgrade to premium engineered hardwood floors. All windows will have white roller shades with white matte finish valence in addition to Taymour polished chrome lever door handles. The one bedroom homes will have frosted glass doors with integral pull system and all homes will come with high-end Blomberg front loading washer and stacked dryer (both in white finish). Some homes have extra spacious roof decks that have hose bib and electrical outlets for year round BBQs. The bathrooms at the East Side Vancouver Cordovan condos includes 24” Acritec Pure Collection basin with a cabinet vanity in addition to an 18” Acritec Pure Collection wall mounted basin in the powder room and 2 bedroom ensuite bathroom (depending on the floor plan of course). Other bath features include matte black porcelain tiled floors and matte white ceramic tiled shower walls. The toilets are high efficiency dual flush by American Standard and the bathrooms have custom vanity mirror millwork that provides extra storage for residents. The baths are finished with a deep, square profile tub with integral apron. The gourmet kitchens at the Cordovan Vancouver Eastside Condos are finished with black polished Caesarstone quartz counters with large islands for dining in one bedroom floor plans. The appliance set includes a 24” GE Moffatt counter depth fridge (white and Energy Star rated) in addition to a 24” GE tub dishwasher in white and also Energy Star rated. The homes are outfitted by leading Panasonic microwave and Blomberg free standing electric range in black. There is a Broan hood fan. Other kitchen features at the Cordovan Vancouver Eastside condos include Pentco full wrap white cabinet doors with soft close mechanisms in addition to a Novanni Elite under mount sink and black under cabinet recessed xenon puck lights. The backsplash is matte black ceramic tile. All of the presale Vancouver Cordovan Eastside apartments come pre wired with in home security alarm system as well as secured, keyless garage and main entries. All homes also have the standard New Home Warranty (2-5-10 Years). SO MUCH, SO CLOSE. Everything surrounds you at the new Eastside Vancouver condo project called the Cordovan. To the WEST is Gastown and central Downtown while SOUTH takes you to Strathcona and historic Chinatown. Union Market is a great place to stop by too. Heading EAST, you get to The Drive, one of the hippest and most eclectic neighbourhoods in East Vancouver. And if you head NORTH, you’ll get to Railtown, a mecca for startups, architecture and design. The top 6 feature highlights about the Cordovan Vancouver East Side condos include in suite flex space (you can use it for whatever you need) in addition to lots of oversized windows that allow sunlight to stream into your living space. The Cordovan cityhomes also have rooftop decks! The bonus details that are standard in every home include elegant roller shades and wall mounted powder room sink. Other small details that make a difference include soft glow task lights and no compromise kitchens with modern appliances, polished Caesarstone counters and sleek matte black backsplashes. You can even access your flat or Cordovan Cityhome through your very own front door that faces a green courtyard! 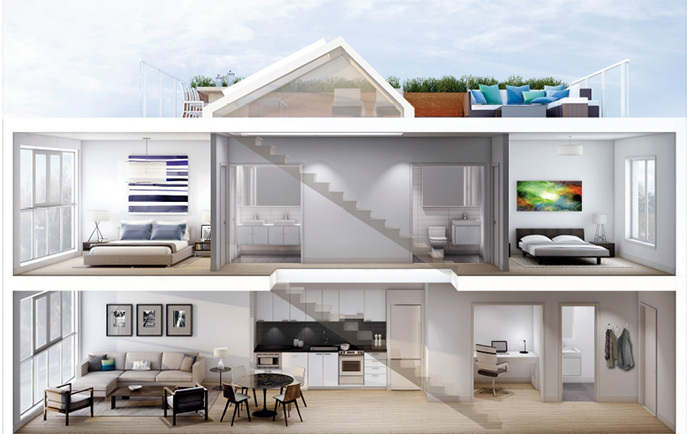 Overheight ceilings and well designed floor plans also means that your home will always feel bigger than it is! Register your interest online today for preview information!